“Monaco, without the barriers” is sometimes the quote used to describe the Hungaroring. A combination of fourteen slow and medium speed corners make up this historic track making it one of the most aerodynamically demanding on the Formula One calendar. More recently, the pit straight has been extended so engineers must also take into account the drag penalty that occurs when piling on downforce producing components onto the car. The summer heat in Budapest means that cooling remains one of the top priorities for teams, with temperatures predicted to be around 40 degrees celsius on Sunday. Red Bull had large openings at the rear of the car as well as louvres by the cockpit area to extract as much heat as possible from the engine, gearbox and radiators. This should play into the hands of the cars that are easier on their tyres such as the Lotus, Force India and Ferrari. However, with the new tyres that are being introduced from this weekend onwards (2013 compounds, 2012 construction i.e. Kevlar belts and stiffer sidewalls), teams will have to decipher how they will affect the car’s dynamics and adjust accordingly. 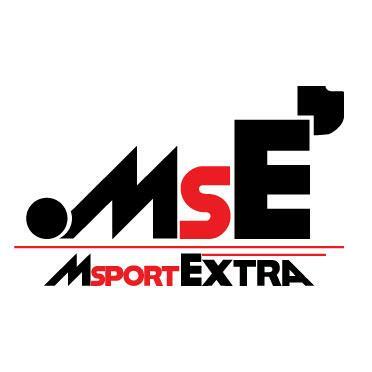 This also means that there could be a slight change to the pecking order as some teams may benefit more than others. The Hungaroring is not used much throughout the year so the track rubbers in a lot during the race weekend, so the last man out on track in qualifying will most certainly benefit. This can often lead to teams going the wrong direction with the setup of the car as the engineers incorrectly predict how the track will ramp up over Friday practice and Saturday morning. The Maranello squad came to central Europe with an updated diffuser package. The new version on Felipe Massa’s car. The two drivers did back-to-back comparisons between the previous iteration and the one seen above to determine whether it was a suitable step. Having admitted earlier today that they still have problems with their wind tunnel the team had a busy day comparing data from both F138. It had new shallow fences that run to the back of the diffuser and utilises a double gurney flap arrangement. Having this at the top of the diffuser creates a higher pressure delta between the top and bottom sides of the floor, forcing the diffuser to work harder and extract more low pressure from beneath. This produces more downforce by sucking the car down to the track. The perforated effect of the gurney flaps end by joining onto a solid surface on the outer wall. Previously the flaps wrapped around the edges of the diffuser wall. Ferrari have also followed Lotus and Red Bull by using the full width of diffuser area that is permitted to extract flow from beneath the car. The main fences have also been extended and curved away from the centre of the car. The engineers sent the car out with Flow-Visualisation (Flo-Viz) to see how the airflow beneath the car was working with the new diffuser surfaces. There was clear airflow detachment at the centre of the diffuser just above the starter motor hole. Flow detachment is indicated when no Flo-Viz paint is evident in a section, leaving just the colour of the diffuser beneath, albeit with a slight stain from the previously sprayed on paint before the car went out. The starter hole slot is designed to reduce this detachment but clearly this has not had much effect. There was also an analysis of the Monkey Seat winglet introduced in Monaco which produces more downforce. It has returned to Hungary due to the higher downforce demands but further inspection of the device was required from the engineers. This is because the winglet experiences much higher airflow speed at the Hungaroring than it does at Monaco so clarification as to whether it works as it is intended was needed before qualifying and race. Introduced at the Young Driver Test (YDT) last week, Sauber saw fit to continue using their full-coanda exhaust layout. This is made up of a ramp that extends from the exhaust pipe exit down towards the floor before meeting its surface just before the rear tyre. I used the image above from my YDT testing post to explain what Sauber are trying to achieve. 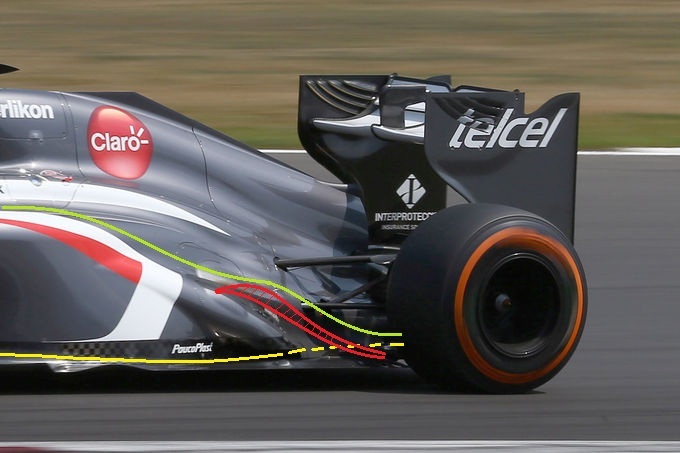 The red area indicates the exhaust plume, the yellow line shows the airflow around the sidepods (the dotted section shows how the flow goes beneath the ramp via a tunnel, exiting before the diffuser) and the green line shows the airflow over the top of the sidepods pushing over the exhaust plume to direct it towards the rear tyre. At the YDT there were images of the bodywork around the exhaust burning, a common issue when testing a new exhaust configuration. The team have since addressed this issue as there were no signs of burning despite the very hot temperatures. By missing the YDT, Mercedes had a lot of time to introduce some aerodynamic modifications to the W04. The team received basic data about the new tyres from Pirelli after the test although this information was shared among all teams and probably had very little relevance to Mercedes. 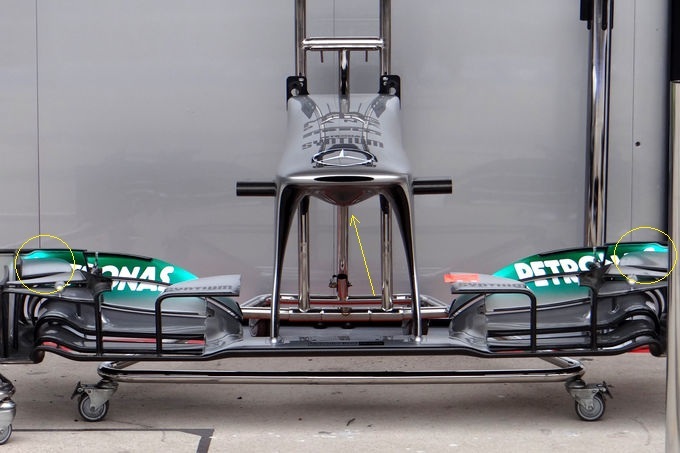 Above we can see the new underside of the W04’s nose. It features a pregnant/pelican chin that helps direct oncoming flow beneath the floor of the car, working the diffuser harder to produce more downforce. As Hungary only has one long(ish) straight, the drag penalty will be minimal although it is quite a small chin in comparison to the Lotus concept. Above are all of the features of the new front wing that was brought in conjunction with the nose. The yellow arrow highlights the chin section we have just been through, but there were also new canards behind the main cascades. These canards are there to control airflow from the cascades themselves as well as ensuring that more laminar flow is being turned around the front tyre to attempt to reduce the effects of the tyre wake to components downstream. The canards have a slight angle to them so will also produce a very small amount of downforce. The Anglo-German team hung a thermocouple out of the slot in the nose that is normally used for driver cooling. The thermocouple was used as a temperature sensor but the reason for this is unclear. Perhaps there are new mechanical components within the hydraulics/front suspension housing that have not been identified yet. Mercedes have been quite late on rear wing endplate development but the Hungarian GP saw the introduction of a tyre wake control slot. This slot minimises the impingement of the tyre wake on the outer walls of the diffuser so the floor can be more efficient when extracting low pressure. The endplates were also more rounded and featured a slight lip to their trailing edges. The Drag Reduction Device (DRD) also returned to the W04, but only for a brief appearance during FP1 on Lewis Hamilton’s car. The inlet arrangement remains the same from the last round but the periscope has been thinned down and has a smooth transition between the horizontal and vertical sections. The outlet of the periscope has also been altered but I do not have any more images to make an analysis of it. A new beam wing (top in image above) was also evident during free practice. It is much more curved at its outboard sections and at the central winglet area. This is more of a general update to try to maximise the potential of the component, so the new version may be able to produce more downforce and reduce drag better than the previous part. Lotus brought with them a high downforce rear wing to suit the twisty turns and slippery track surface. The wing is almost identical to the one featured on the E21 in Monaco. Such are the similarities between the two circuits that both Lotus and Ferrari saw fit to bring bespoke parts made primarily for Monaco to here in Hungary. The upper flap chord is much larger. This will cost them straightline speed but this should not be such a big factor as there are only two DRS sections this year and the straights are relatively short. The leading edge of the main plane is curved upwards at its centre, with the outboard edges far shallower. This is to at least compensate for some of the induced drag gained from running with a larger top flap chord. 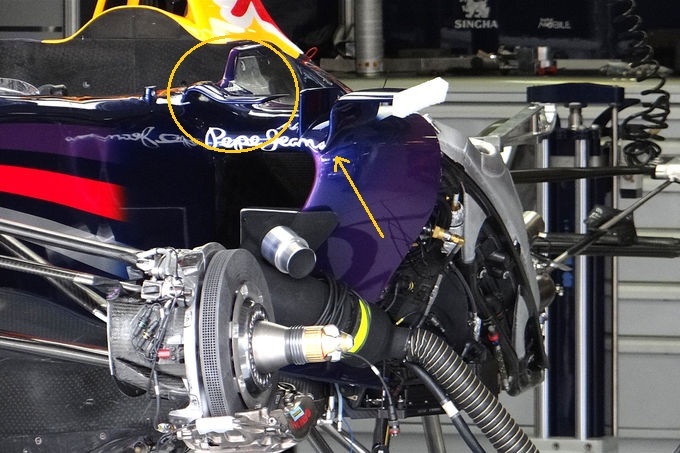 It is believed that Lotus were asked by the FIA to install these (top of image) large rear-view mirrors for free practice, although this has yet to be clarified. They are much larger and more bulky, designed to increase visibility. Rumour has it that they may become the “standard” mirror for next year, but I doubt that the design will receive any praise from team bosses. Red Bull’s factory in Milton Keynes has been pretty busy of late producing yet more modifications for the RB9. The front wing received more treatment with the engineers choosing to revert the camera pod positions back to the “hammerhead shark” layout from the start of the season. Placing the pods at the tip of the nose produces local downforce right at the front of the car, allowing the driver to have a more pointy front end. The outboard edges of the front wing were also replaced with more rounded elements similar to those found on the Mercedes. The slots separating the elements were more sinuous and slightly larger than the previous edition. These changes may have come about to suit the dynamics of the new tyres as this wing was not evident at the YDT last week. The arrangement of the elements at the wing tips has the greatest influence as to how the airflow reacts with the front tyres and also how the following flow is fed to downstream devices. Noticeably different sidepod details were upon the RB9 this weekend. The arrow is pointing to the position of the sidepod airflow conditioner mount relative to the Vortex Generator (VG) fence, which has been moved outwards. Note how there is now only one fence compared to the previous layout which had two, more spread out VGs. In place of the second VG is an interesting canard, highlighted by the circle. Mounted to the cockpit side it curves downwards, forming and thin aerofoil shape. Lotus and McLaren have similar concepts to this and it is used to produce downwash over the top of the exhaust plume to guide it towards the rear tyre area. Getting rid of the inboard VG leaves room for the longer vortex generated by the new device to carve its way down the sidepod surface and onto the plume. At the YDT, McLaren tested a number of components seen on last year’s MP4-27. Why? Because the new tyres are identical in construction to those in 2012. The construction of the tyre changes the aerodynamic characteristics of the car as tyre “squash” is different depending on the stiffness of the sidewalls and shoulders of the tyre. The team believes that the tyres used from the Australian GP through to the German GP have had a negative impact on the dynamics of the current MP4-28 as it was firmly designed around last year’s tyres. Now the 2012 construction has returned, items that were previously binned in pre-season testing and from the MP4-27 have found their way back to the track. Used for a large proportion of last year, the above image shows three VGs that were trialled at the YDT. These were seen at the first winter test in Jerez but were subsequently abandoned after deemed useless with the characteristics of the now old 2013 tyres. Other teams have also seen the opportunity to bring back components tested in pre-season to see if they compliment the new tyres here in Hungary. This entry was posted in 2013 Highlights, Technical Highlights on July 26, 2013 by thewptformula.